The long history of anti-Semitism in Muslim lands. This was his explanation of the murder of 202 people eight years ago. Of those who died, 88 were Australians, 38 Indonesians, 24 British. None were Jews. So what was Amrozi, a Java-born Indonesian, raving about? It’s a question worth considering as we assess the recent arrests for terrorist conspiracy in Ottawa. Islamic terrorists can finds motives in ancient struggles the rest of the world long ago forgot. Martin Gilbert, the author of some 80 books, including the official biography of Winston Churchill, explains Amrozi’s meaning at the start of his alarming chronicle, In Ishmael’s House: A History of Jews in Muslim Lands, published last week. Amrozi was remembering an event 1,375 years in the past, when Muhammad attacked Jewish farmers living in the oasis community of Khaibar, in what is now Saudi Arabia. More than 600 Jews were killed and the survivors lost all their property and had to pledge half of their future crops to Muhammad. Today, few Jews know the word Khaibar. But among certain Muslims it has permanent resonance. Khaibar set a precedent, endorsed by the actions of the Prophet. After Khaibar, non-Muslims who were conquered had to give up their property and pay heavy permanent tribute to their Muslim overseers. That form of discrimination lasted for centuries. It was this incident and its aftermath that nourished Amrozi’s homicidal ambition. 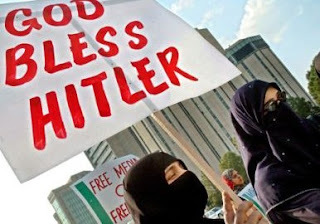 Muslims love to recall that Jews once lived in peace among them. Of course, Jews were always second-class citizens, their rights sharply limited. Still, it was sometimes better than settling among Christians. Bernard Lewis, a major authority on Islam, says that Jewish lives under Islam were never as bad as in Christendom at its worst, or as good as in Christendom at its best. Well before Israel’s creation in 1948, Arabs were identifying Jews as enemies. In the 20th century, Arab hostility to Jews took an ugly turn. Some claim that the new state of Israel “caused” the trouble. But well before Israel’s creation in 1948, Arabs were identifying Jews as enemies. In 1910, in the now-Iranian city of Shiraz, mobs robbed and destroyed 5,000 Jewish homes, with the encouragement of soldiers. In 1922, in Yemen, an old decree permitting the forcible conversion of Jewish orphans to Islam was reintroduced. The government searched towns and villages for children without fathers, so that they could be given Muslim instruction. The children were chained and imprisoned till they agreed to convert. In 1936 in Iraq, under Nazi influence, Jews were limited by quota in the public schools, Hebrew teaching was banned in Jewish schools and Jewish newspapers were shut down. Anti-Semitism intensified when Israel was created, and grew still worse after Israel won the Six-Day War of 1967. By the 1970s, about 800,000 Jews, perhaps more, had been forcibly exiled from Arab countries, their property seized. According to the World Organization of Jews from Arab Countries (WOJAC), they lost property now valued at well over $100-billion. A majority of these exiles settled in Israel. In the 1950s, the UN recognized them as refugees and compensation was discussed. Later, the Arab states turned the UN against Israel and, by association, against Jewish refugees. In 1975, the General Assembly condemned Zionism as “racism and racial discrimination.” Various political leaders in the West (notably Irwin Cotler, the former justice minister of Canada) have continued to argue for compensation. But after the 1975 resolution, as Gilbert notes, that idea was unlikely to receive any UN support. The number of Jews displaced by the Arabs in the 20th century roughly equals the number of Palestinians displaced by Israel. But the plight of the Palestinians has received several hundred times as much publicity. One reason is the constant propaganda from Muslim states and their admirers in the West. Another is that many Jews, unlike Palestinians, don’t want to be called refugees. Gilbert quotes an Iraqi Jew, Eli Timan, living in London: “The difference is that we got on with our life, worked hard and progressed so that today there is not a single Jewish refugee from Arab lands.” Those who suggest that this model be copied elsewhere will of course be condemned as heartless bigots.